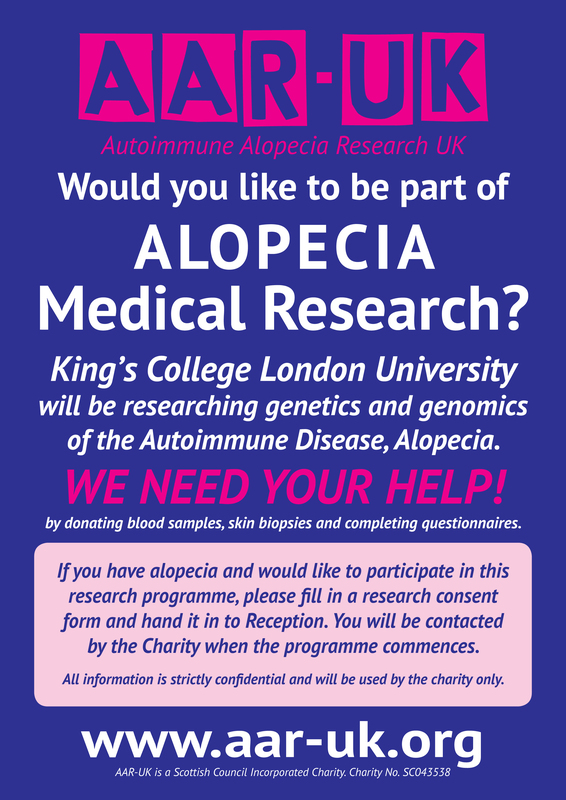 TO PLEASE BE PART OF OUR RESEARCH PROGRAMME WITH KINGS COLLEGE LONDON UNIVERSITY. IF YOU CONTACT JAYNE’S EMAIL jayne@aar-uk.org QUOTING YOUR NAME AND ADDRESS I SHALL POST YOU OUT A RESEARCH CONSENT FORM FOR YOU TO SIGN AND POST BACK TO US. THIS WILL PUT YOU ON OUR DATABASE TO BE CONTACTED WHEN THE PROGRAMME COMMENCES. THIS IS SO IMPORTANT BECAUSE WITHOUT VOLUNTEERS/PARTICIPANTS THIS CANNOT BE DONE… WE NEED YOU! I’d love to be involved, but with regard to blood samples and skin biopsies, where would these be done? Would I have to travel to London for them? Great news. My daughter of 10 who lost all her hair in the space of 6 weeks in 2012, has started to experience regrowth through nutrition and chinese herbs, however it is starting to fall out again. We really need research on this disease. I will sign my daughter up even though we live in Luxembourg, we are regularly back in London to see a wholistic doctor, we will find a way to help. I also have some ideas about raising money over here. Together we have to find a way to get some answers and beat it!